The US Africa Command best known as AFRICOM Wednesday said it killed four members of al Shabaab militant group in Somalia, in an airstrike. “U.S. forces conducted a self-defense airstrike targeting al-Shabaab militants in the vicinity of Awdheegle, Somalia on December 04, 2018,” Africome said in a press release, indicating the operation was in support of Somalia’s continued efforts to degrade al-Shabaab. The U.S. airstrike was conducted against militants after U.S. and partner forces came under attack, the press release said adding that according to initial assessment, the airstrike killed four militants with no civilians involved. U.S. force had conducted an airstrike targeting al-Shabaab militants near Lebede, Somalia on November 30, killing nine militants. Africom renewed commitment to prevent, alongside Somali and international partners, al-Shabaab from taking advantage of safe havens from which they can build capacity and attack the people of Somalia. 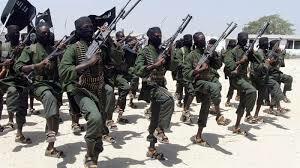 In particular, the group uses portions of southern and central Somalia to plot and direct terror attacks, steal humanitarian aid, extort the local populace to fund its operations, and shelter radical terrorists, it recalled. Africom said it will continue to work with its partners to transfer the responsibility for long-term security in Somalia from the African Union Mission to Somalia (AMISOM) to the Federal Government of Somalia and its Member States. Meanwhile, U.S. forces will use all effective and appropriate methods to protect the Somali people, including partnered military counter-terror operations with the Federal Government of Somalia, AMISOM and Somali National Army forces, it said. Al Shabaab has waged years of insurgency but is currently losing ground due to the presence of UN forces who have been backing regular forces. Posted by Geraldine Boechat on December 6, 2018. Filed under News, Zoom. You can follow any responses to this entry through the RSS 2.0. Both comments and pings are currently closed.